Sports Costs > How Much Do Basketball Shoes Cost? How Much Do Basketball Shoes Cost? A true basketball player knows that the right basketball shoe can really make a difference in their game. When choosing a shoe, you need to pick one that is not only comfortable but is also light and supportive. 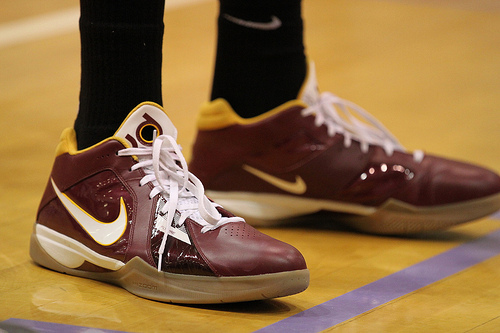 Men’s basketball shoes will generally cost between $75 and $200. This price will greatly depend on the brand, the cut, the size, and the store which is selling it. Refer to our table below for the prices of the most popular brands on the market today. Eastbay.com, for example, sells the newest Nike basketball shoes for about $160. The Finish Line, on the other hand, sells the newest Adidas shoes for as little as $79.99. Women’s basketball shoes are usually cheaper than men’s because of the size difference. At The Lady Foot Locker, for instance, the top sellers retail for $60 to $95 on average. Children’s basketball shoes are usually the same price range as women’s, sometimes even slightly cheaper. According to this helpful eBay.com guide, most shoes can range from as little as $20 to more than $200. Basketball shoes are commonly going to be made from either a plastic-based synthetic material or a raw material such as leather. The plastic-based synthetic material is able to withstand damage better than a raw material and will allow your foot to breathe easier. A raw material often feels better on the feet but won’t hold up as well. Other parts of the shoe will include the laces, which can be a traditional shoelace setup or even through a new lacing system the manufacturer developed. If the shoe doesn’t have laces, it will more than likely have a strap or zipper. Basketball shoes will commonly come in the following ankle heights: low, mid and high. Low-tops are ideal for players who tend to be speedy and need to move around more since high top ankle supports tend to add firm support, limiting your movement. Mid-tops are designed for players who tend to be an all-around player and play all sorts of roles on the court. Lastly, a high-top is best for a position such as a center who consistently jumps and pivots. If your foot is larger than a size 14, many brands and stores will charge extra. Cleaning kits can start at $5. These are ideal for those that want to keep their shoes looking like new or for those who wear their shoes off the court. An extra pair of laces, while optional, are ideal for those just in case the originals get dirty or torn. Customized shoelaces are also available for those that want a different color selection. Try not to focus too much on the style because just because it looks pretty doesn’t mean it’s going to play pretty. Pay close attention to the rubber thickness. The thicker and softer the rubber is, the better the traction will be. Most shoes designed for the outdoors will tend to be the thickest. Try out your shoes in a store as every shoe is going to fit differently. When trying a shoe on in the store, act as if you’re playing a game. This is a good indicator on if the shoe is going to work out for you. If you want to purchase online, there’s a way to make sure you purchase the right size. Simply place your foot on a piece of paper with your athletic socks on. From there, trace the outline of your foot. Once traced, measure your foot from the top of your longest toe to the bottom and subtract about .25 inches. Do the same with the width of your foot as well. With these numbers, use this Nike shoe fitting guide to see which size you need. If you do purchase online, make sure you check out the store’s return policy in case the shoes don’t fit. When wearing your shoe, keep in mind that you’re going to need to have your feet breathe. Avoid shoes that are either too tight or shoes that don’t give you that much breathing room as this is going to cause a lot of sweating. Consider purchasing shoes that have breathable material such as mesh or nylon. A fun fact: The most expensive basketball shoes every sold were the Nike Air Zoom Kobe 1, which sold for $30,000. If you know exactly where you want to purchase your shoes, consider buying a discounted gift card on Raise.com. Depending on who you purchase from, this could save you up to 10 percent or more. Also, if purchasing online, consider looking at eBates to see if you can get cash back by simply clicking their lick. Look for bulk discounts. Eastbay Team Sales, for example, gives discounts when ordering multiple pairs of matching shoes for a team. Consider purchasing your shoes used. Auction sites, such as eBay, are a great platform to save on your shoe purchases. Be sure to ask the seller about how they have been used in the past, as you don’t want to purchase shoes that are too old. Check out garage sales and Craigslist as well for deals as well.